Pete’s Tire Barns uses a variety of green initiatives to reduce our carbon footprint and to help limit our impact on the planet. This is accomplished through a combination of efforts to reduce our overall consumption, reuse resources multiple times and recycle waste products before they end up in a land fill. 1. Our retread facility will save over 1 million gallons of oil this year. It takes approximately 29 gallons of oil to build a new tire and 7 gallons to produce a retread. 2. Our retread facility will save approximately 160,000 gallons of oil this year by performing major repairs on truck tires and returning them to service. 3. We will recycle approximately 360,000 lbs. a year of polyurethane to be used in our flat-proofing process, with a savings of approximately 18,000 gallons of oil per year. 4. With our Earthmover and Farm Tire section repair facility, we will save approximately 65,500 gallons of oil that would be needed if we didn’t repair those tires. 5. Any time we undergo construction, we save the old building material. Any boards are recycled to a lumber yard and bricks and cement are made into process gravel for pavement base. 6. All used brass valves, lead wheel weights and aluminum and steel rims are returned to our Distribution Center for recycling. 7. Small cardboard boxes are returned to the Distribution Center to be re-used for shipping tubes and flaps. The remainder is recycled at our local transfer station. 8. Wooden pallets are returned to a pallet manufacturer to be repaired and put back into use. 9. All lighting in stores are being changed to the most energy-efficient available. 10. Signage lighting is turned off to save electricity. 11. Distribution Center forklifts are powered by electricity to save on diesel and propane costs, a savings of about $3,750 per year. The use of electricity also improves air quality and noise-reduction in the building. 12. Fleet service truck bodies are aluminum so that they may be re-used and the lighter weight will help to reduce fuel costs. The lift gates are galvanized to reduce the need for replacement due to the material’s resistance to rust. This also eliminates the need for yearly painting, thereby reducing emissions. 13. We have installed air deflectors on the fronts of our large delivery box trucks which will save approximately 400 gallons of diesel a year per truck. 14. We have ongoing driver training programs on reducing fuel consumption with savings upwards of 30%. We are developing a program that will identify drivers who are able to attain fuel saving and sharing a percentage of those savings with the driver. 15. We are running synthetic oil on transmissions, rear ends and wheel bearings that will lower rolling resistance, reduce friction and allow for longer draining intervals. 16. We have set the on-board computers in the delivery box to shut down the engines after 3 minutes of idle time and to not exceed 65 mph. with each 2 mph that the speed limit is reduced, we gain ½ mpg. 17. Scrap tires are collected, shredded and burned for fuel in a power plant, saving approximately 5,000 gallons of oil per day from being burned. 18. We are working on a program that would reduce oil changes to intervals of as much as 20,000 between changes. 19. We have three locations that are burning waste oil for heat, saving approximately 5,000 gallons of heating oil per year. 20. All lead batteries are returned to the manufacturer for recycling of their components. 21. As a result of reducing waste, we have replaced most of our dumpsters will smaller (2-yard) containers with collection reduced to every other week. 22. We will be baling plastic waste material from our retread facility and selling it for recycling. 23. Rubber removed while retreading (approximately 40,000 lbs. per month) is sold and recycled into rubber floor mats. 24. We have changed the tires on our delivery box trucks to low rolling-resistance green tires, saving 8 to 9% fuel per year. 25. We have installed photo cell sensors on all lighting at our Distribution Center so that the lights will only turn on when there is movement underneath, saving approximately $5,000 per month. 26. Special light-emitting materials were used around the perimeter of our new 3-acre Distribution Center to allow for natural inside area lighting, thus reducing electrical useage. 27. We have reduced the temperature in the Distribution Center in the winter from 60 to 50 degrees, which will save roughly 8,000 gallons ($40,000) of heating oil per year. We run 50% non-toxic biodegradable antifreeze in the heating system allowing us to run at this lower temperature. 28. In the winter months, we are utilizing heat from our air compressors to heat our retread facility and service area. 29. We have installed fans in the Distribution Center to bring in warm air at mid-day when the outside temperature is over 50 degrees in the spring in fall to save burning fuel for heat. 30. We are replacing all lead balancing weights with steel and zinc to help keep lead from getting into the drinking water supply and to minimize handling of lead by our employees. 31. 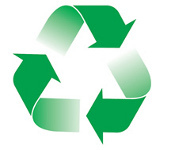 We are recycling copy and fax machine toners by having them refilled and returned to us at a savings of 50%. We also are returning ink cartridges to the manufacturers for a recycling credit. 32. We installed an energy-efficient refrigerated air dryer with true-cycling, reducing electrical consumption by better than 50%.